Playing games is a great way to keep your students engaged and learning and this resource contains 4 games designed to help your students better understand Nonfiction Text Features. Text Features Memory - Just print the game cards on card stock and laminate. 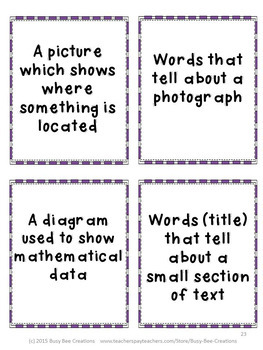 Students take turns turning over one picture card and one definition card in hopes of making a match. If the player makes a match, they get to keep the cards and pick again. If not, it is the other player’s turn. Play until all of the cards have been matched. The winner is the player with the most matches at the end. Text Features Tic-Tac-Toe - Print the game boards provided. If the boards are laminated, they can be reused. The first player turns over a card and looks at the picture or definition. If they can name the nonfiction text feature represented on the card correctly, they can put either their X or O on the tic-tac-toe card. Just like traditional tic-tac-toe, the first student to get three Xs or Os in a row is the winner. A reference sheet has been included in case students need double check to make sure the answer they gave is correct. 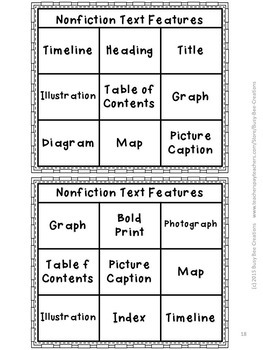 Text Features Fill-Up – Each student receives a game board. The teacher will show either a text feature picture or a text feature definition. Students who have that nonfiction text feature on their board get to cover that space. The first student to fill up or cover up their board is the winner. For a quicker game you can have the students just fill up 3 in a row to win. 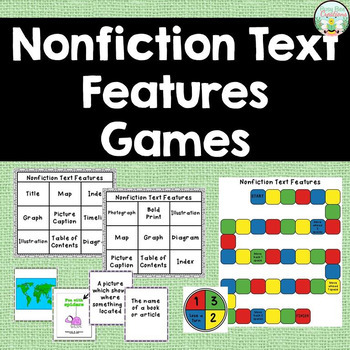 Nonfiction Text Features Game Board – This game can be played with 2-4 players. Students take turns spinning the spinner and choosing a text feature card. If the students can correctly name the text feature shown or described on the card, they will move the correct number of spaces on the board. If they cannot correctly name the text feature they lose their turn. There are a few spaces on the board where a lucky player may get to jump ahead a few spaces or an unlucky player may have to jump back a few spaces. The first player to get to the FINISH is the winner. This game has also been provided in black and white to save your colored ink. This resource is part of a BUNDLE!! Click here to take a look! 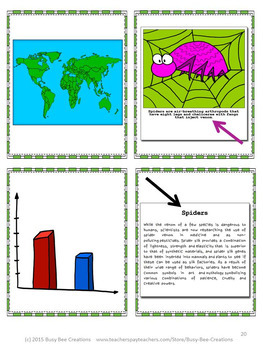 Check out all of my resources for teaching nonfiction text features by clicking here! It pays to become a follower! All new resources are discounted 50% off for the first 48 hours. Just look for the green start at the top of the page next to my store logo and click on it to become a follower. When you do this you will receive email updates and information about upcoming sales and new products! Have Questions? If you have any questions about this product, please feel free to send me an email at abusybeecreations@gmail.com. I am always happy to help! Want to see more? Follow me on Pinterest! © Busy Bee Creations – This product is intended for single classroom and personal use only.